FILE - Members of Taliban delegation take their seats during the multilateral peace talks on Afghanistan in Moscow, Nov. 9, 2018. An Afghan Taliban delegation visited Iran on Sunday and held bilateral talks on promoting peace and stability in Afghanistan. The development comes as the Afghan insurgent group claims it has established control over 61 of the 407 Afghan districts during the 2018 fighting season. Iran's Foreign Ministry spokesman Bahram Qasemi told a televised weekly news conference Monday that Taliban delegates held detailed discussions with Iran’s deputy foreign minister Syed Abbas Arghchi during their stay in Tehran. “The main purpose of these talks was to help advance efforts aimed at starting peace negotiations between rival Afghan sides for bringing peace and stability to Afghanistan,” explained Qasemi. The spokesman noted that the Taliban “are in control of 50 percent of Afghanistan” and the insurgent group had sought the meeting with the Iranian government. Qasemi added the Afghan government had been informed about the interaction in advance. The Iranian spokesman said the two countries share a long border with mutual cultural and historic commonalities. FILE - Secretary of Iran's Supreme National Security Council Ali Shamkhani, holds a meeting on Syria in Tehran, Jan. 17, 2017. 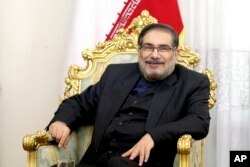 The meeting came just days after Ali Shamkhani, secretary of Iran’s Supreme National Security Council, visited Kabul and revealed there that Tehran was in talks with the Taliban to help further the Afghan peace process. The United States in recent months has engaged the Taliban in direct talks and both sides sounded upbeat about future progress after last month’s meetings in the United Arab Emirates. Washington’s diplomatic initiative is aimed at jumpstarting a dialogue between the Taliban and the Afghan government aimed at finding a political settlement to the 17-year-old war. But the Taliban refuses to hold direct talks with Kabul and demands the complete withdrawal of all U.S.-led foreign troops from the country before it joins any Afghan peace process. Meanwhile, the insurgent group claimed Monday battlefield advances during 2018 have brought a total of 61 of the 407 Afghan districts under “complete” Taliban control. The gains have forced U.S. President Donald Trump to review his administration's Afghan war strategy, the Taliban claimed in its so-called annual report of progress. It said the Taliban hotly contests the rest of the districts across Afghanistan. Trump unveiled his Afghan strategy in August 2017 that sought intensified aerial bombings to increase pressure on insurgents and force them to come to the table for peace negotiations with the U.S.-backed government in Kabul. “This report is based on precise data collected from concerned areas and verified by primary sources, leaving no room for suspicious or inaccurate information,” it said. The Taliban went on to claim killing nearly 23,000 Afghan security forces, including hundreds of their commanders, and about 250 personnel of the U.S-led foreign military coalition, though insurgent battlefield assertions are inflated most of the time. There was no immediate reaction available from the Afghan government. A U.S. watchdog in its quarterly report last month noted government control or influence of its districts reached the lowest level to 55.5 percent over the past three years. The Special Inspector General for Afghanistan Reconstruction (SIGAR) quoted the U.S. military assessment as saying that as of July 31 the Afghan government controlled or influenced 226 districts and that the Taliban controlled or influenced 49. It said the rest of the 132 districts were identified as contested. By comparison, the Long War Journal, a non-profit American news website which reports on the war on terror, assessed at the time the Afghan government controls 145 districts, the Taliban controls 52, and 199 are contested. While the Kabul government has lately barred the U.S. military from making public Afghan forces’ casualties, President Ashraf Ghani disclosed last month nearly 29,000 soldiers and police personnel have been killed in battles against Taliban and other militant groups since 2015. Afghan Defense and Interior Ministry chiefs informed the national parliament in October around 40 military and police personnel were being killed every day in Taliban attacks.